The Call to Conference will be mailed tomorrow, Friday, March 1st – please note it has a different look this year! The two-sided 8 ½ X 11 document is folded in half and includes a prominent cross and flame logo on one side and the clock tower at Hofstra on the other side. The eight-page Call includes letters from the bishop and lay leader; announcement of the guest speaker, registration information, event details, legislative sections, travel directions and a campus map. The Call is addressed to the members reported on the 2012/2013 online charge conference summary form; if this report was not submitted, the secretary’s office used the names submitted in 2011. If you know of a member who did not receive this registration information please advise them to contact their district office for a copy. This document was mailed to the District Lay Members At-Large using the latest information provided by your district superintendent. 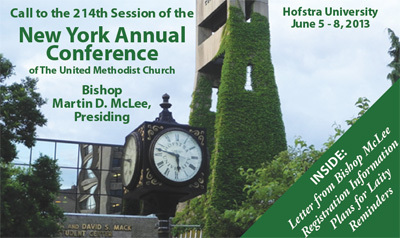 The 214th Session of our Annual Conference will be held at Hofstra University, June 5 – 8, 2013. 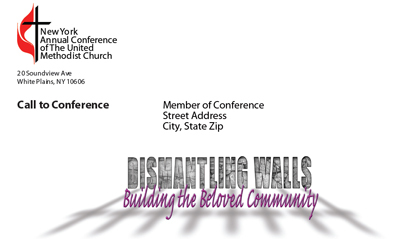 The theme of the conference will be, Dismantling Walls, Building the Beloved Community.